The Celestial Effects Coating System, part of CENTRIA’s dynamic line of polyvinylidene fluoride (PVDF) coating systems, offers a range of luminous color options for a distinctive aesthetic as well as extreme weather performance. “The Celestial Effects Coating System showcases deep, radiant colors that shimmer in the light, providing a truly unique effect that you won’t find in any other coating,” said Dave Donovan, CENTRIA coating systems product manager. 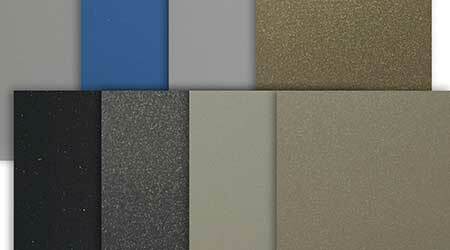 Celestial Effects is a PVDF coating system that makes exterior walls stand out with extraordinary color, while offering superior gloss retention on a variety of metal substrates, including aluminum, hot-dip galvanized (HDG) and Galvalume. The unique coating system also resists fading, chalking, dirt and stains, so projects retain their intended vibrant façade. This flexible, formable coating system can be utilized for virtually any project type and CENTRIA’s extensive line of exterior metal building products. Celestial Effects is also available for coil and extrusion applications.